The ending of Awake was always going to be kind of unsatisfying. The show was cut short after just one season and there were huge metaphysical questions as well as an Evil Conspiracy up in the air. So it's probably for the best that the show's creators opted for the Full Mindfuck ending, as opposed to trying to create actual closure. Here's what we got out of it. 1) Rex is really dead and Hannah is alive. And the episode where Michael goes bungee-jumping and stops "waking up" in the world where Rex is alive is the closest that Michael comes to facing reality. Michael almost has a real catharsis and starts coping with Rex's death, and breaks down crying and freaking out — but then he can't handle letting go of his son, so he invents a whole delusion about Detective Hawkins, leading him to unravel this conspiracy that's all in his own mind. In the end, Michael's obsession with Hawkins and denial of his own son's death leads him to go nuts and get himself locked up — while meanwhile, his imaginary world in which Rex is alive has a perfect resolution, in which all the "bad guys" get caught. 2) Hannah is really dead and Rex is alive. 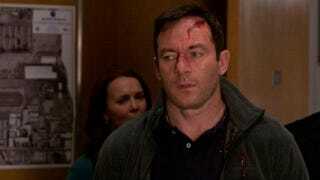 And Michael faces a crisis in last night's episode, when he realizes that in order to catch Captain Harper, the last of the conspirators behind the car accident, he must let go of his delusions about Hannah really being alive. That's why he has that extended dream sequence where he meets his own self, who tells him that he has to take a drastic step to get Harper. And then he says goodbye to his wife in the dream sequence, while also confronting the evidence that Harper was part of the evil conspiracy. But once he succeeds in incriminating Harper, going by the book, he's meeting with his therapist who congratulates him on making a breakthrough in recognizing the "Hannah is alive" world as a dream. And at that moment, Michael balks. He is finally recognizing that he's let go of his dead wife, and he's going to have to commit to living in a world with his son and mourning his wife's loss. And instead, he concocts a new fantasy, in which the therapist suddenly pauses like a videotape, and he is able to walk out into a world where both his wife and his son are alive. Surprise! 3) Both Hannah and Rex are alive. And Michael's just been having an extended fugue state. Or something? I'm not even sure how that would work. There's almost no way to take that ending literally, that I can see. 4) Michael has had a psychotic break. This is probably what "really" happened. As we've pointed out over and over again, neither of Michael's worlds has ever entirely made sense, and this "they're both alive" ending definitely made no sense at all. The show's final moments are best seen as Michael divorcing himself from the real world once and for all, embracing a totally delusional fantasy in which he gets to have absolutely everything he wants. We may never know what "really" happened on this show, but the most likely explanation is that the car crash caused Michael's psyche to splinter. And the whole run of the show has been Michael refusing to come to grips with reality, over and over again — until finally, he just outright breaks. Best guess? Both the wife and the kid are dead, there is no conspiracy, and Michael has been doing his job as a cop this whole time, while getting less and less in touch with reality. Except that The Prisoner was about escaping from the Village — while here, Michael is escaping from reality. But in both cases, the "escape" is a matter of busting out of the consensual reality that everybody else occupies, and reasserting the individual's ability to choose his own destiny. And that, apparently, always involves people in penguin suits and weird "Dem Dry Bones" dancers. In the end, Michael's standing up for his right to choose his own version of reality, no matter what everybody else thinks. The problem with that? When you assert your own will over the fabric of reality, you are going to end up alone. And that goal, in turn, is in conflict with Michael's need to be with his wife and child. You can only have other people in your life if you're willing to live in the same world that other people live in. I'm not entirely sure that Awake succeeded in making the final statement that it needed to make — it might have been better if the show had found a way to commit to one world being the reality that doesn't go away when you reject it. But instead, the show made a final definitive statement in favor of madness and fantasy. Like Number Six, Michael Britten refuses to be trapped in other people's versions of the world, even if that means being a total lunatic.